Le livre "LE JOURNAL INTIME DE SUBLIMA"
Women's History Month 2018 in March - Theme : " Nevertheless,She Persisted : Honoring Women Who Fight All Forms of Discrimination Against Women "
24 heures - Championnats de France des 24 Heures 2017 à Vierzon - "Un merveilleux moment de partage et de plaisir"
The Adventures of the writer and ultra marathon runner Ronald Tintin. Be yourself, believe in yourself and never give up. MAIF Ekiden de Paris 2018, dimanche 4 novembre Pont d'Iena. Voyager, courir à Paris avec l'écrivain et marathonien Ronald Tintin. 20 Km Marche de Neuilly-sur-Marne 2018, dimanche 23 septembre. Critérium LIFA d'Automne 2018 des 20 km Marche. Résultats 2018. Marathon de Paris 2018, 8 avril - Schneider Electric Marathon de Paris. Courir solidaire de Ronald Tintin pour la lutte contre le cancer. Jeux Olympiques d'été Paris 2024 - "A nous Les Jeux. Ensemble Célébrons La Victoire." Ronde d'Enghien 2017 - Coline Galmiche bat son record sur 10 km! Easter Sunday 2017, April 16th! Happy Easter Sunday from Les Aventures de Ronald Tintin! Congratulations Coline Galmiche! Journée internationale de la femme 2017, 8 mars. Thème 2017 : Les femmes dans un monde du travail en évolution. Women's History Month 2017 (March). Women's History Month 2017 Theme "Honoring Trailblazing Women in Labor and Business"
Ekiden de Paris 2016 . Marathon-relais (42,195km) par équipe de 6 athlètes. Happy Bastille Day! Bonne Fête nationale française du 14 juillet! Portugal are European Champions on Sunday, July 10th 2016. Never give up because you are a winner. Great long running un the sun on Sunday, July 10th 2016 !!! Happy Eid Mubarak on Wednesday, July 6th 2016 !Running in the the nature. Love, Sport,Fitness with motivation to support cancer charity and do good. Motivation makes the difference. Great tempo run on Saturday, August 29th 2015 !!! Courir à jeun et perdre du poids. Fitness, Bien-être, Santé et motivaotion pour soutenir la lutte contre le cancer du seein. Happy birthday Claudia Gameiro !!! Ronning Against Cancer's nice running on Monday morning, August 10th 2015 !!! Congrats Elise Marchand for your BAC 2015! Great run on Friday morning, July 10th 2015!!! Une Jonquille Pour Curie 2015, Faites fleurir l'espoir contre le cancer ! Odysséa Paris 2013 (5 et 6 octobre), courses et marches contre le cancer du sein. Foulées Estivales d'Asel de Torcy 2013 : Très belle course sous le soleil en portant les couleurs de l'Institut Curie!!!! Marathon Relais Paris Val de Marne 2012 avec Ronald Tintin : "courir pour le plaisir d'être ensemble"!!! Père Noël et Mère Noël, lettre de marathonien Ronald Tintin !!! Semi Marathon de Boulogne : curieux résultat de Ronald Tintin, mais joli footing!!! 6h de Cosne 2011 : Ronald Tintin soutient l'Association "Mots pour maux d'enfants"
Marathon de Paris 2011 : Ronald tintin animera avec "Les Miss & Boy's Marathon"
No finish line (trophée 24h) : Faire confiance et volonté de me dépasser !!! Semi marathon de Boulogne Billancourt 2010 : Ronald Tintin s'entraîne un peu!!! Pic du Midi de Bigorre !!! La Course du Château de Vincennes: Au Bonheur des Dames !!! Foulées du 8 mai 2010 : Explosion de joie après l'effort ! Marathon de Paris 2016 (Sunday, April 3rd)) : 40th edition. Ronald Tintin, Super Professeur, Lyna Hussein and the project « Ronning Against Cancer »’s UPCOMING event running to support the fight against cancer. Run for charity. Save the date and the place to be “Marathon de Paris” 40th edition on Sunday, April 3rd 2016 ;) Supported by Ronald Tintin, Super Professeur, Lyna Hussein and Ronning AgainstCancer. 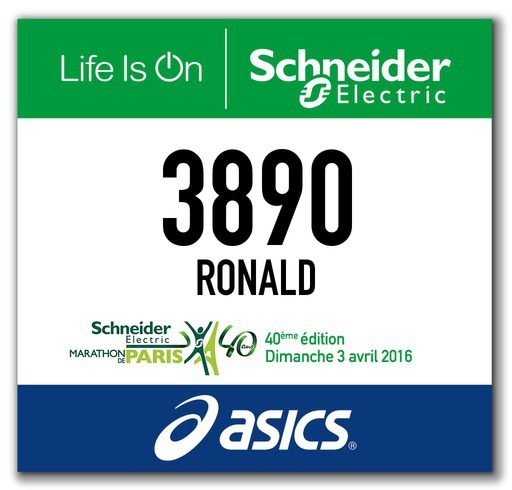 The Schneider Electric Marathon de Paris 2016 (Sunday, April 3rd ) : 40th edition. Ronald Tintin, Super Professeur, Lyna Hussein and the project « Ronning Against Cancer »’s UPCOMING event running to support the fight against cancer.Run for charity and Do Good. Back to Paris marathon (26.21875 miles or 42.195 kilometers) for the 40th edition on Sunday, April 3rd 2016. Ronald Tintin,Founder of the projet Ronning Against Cancer, in Salon du Running 2016 - Marathon de Paris on Thursday night, March 31st !!! Love,Fitness, Hope, Health,Lifestyle,Sport,Passion,Wellbeing with great motivation and positive thoughts to support the fight against breast cancer and raise funds !!! The Schneider Electric Marathon de Paris offers a unique opportunity to make the city yours by participating in one of the most prestigious races over the legendary 42.195 km distance. The Schneider Electric Marathon de Paris is now one of the biggest marathons in the world, as much for the size of its field as the performances of its runners. Each finisher comes home with incredible memories. Nearly 145 nationalities and 57,000 runners come to tackle the most fabled long-distance discipline in athletics. In April, this race across Paris, taking in the Champs Elysées, the Bois de Vincennes and Boulogne, offers an incomparable backdrop, with spectacular views and landmarks all along the route. The Salon du Running fair at Porte de Versailles, taking place three days before the marathon, is also an occasion not to be missed, a gathering of over 80,000 visitors with more than 200 professionals from the running world. The marathon itself combines personal challenge with the chance to discover one of the world's great cities. The athletes will pound the pavements of the French capital's most famous avenues and plazas, from the foot of the Arc de Triomphe, where they take the start, towards the Place de la Concorde. From the Rue de Rivoli they'll then sweep through the Place de la Bastille. After a glimpse of greenery in the Bois de Vincennes, views of Notre Dame and the Eiffel Tower point the way home. Every year, this unique and spectacular setting attracts more and more entrants. There are now more than 23,000 runners from abroad, making up 40% of the field. So, come and join us at the Schneider Electric Marathon de Paris.